Dedicated to past and present members of St. Peter and St. Paul Ukrainian Orthodox Church of Sundown. 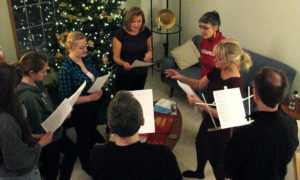 For Ukrainians, visiting our friends and carolling is an important part of our Christmas tradition. In the past, members of St. Peter and St. Paul Ukrainian Orthodox Church travelled throughout the parish singing kolyadeh, traditional songs usually sung only on Orthodox Christmas holidays, between the 7th and 14th of January. Unfortunately, this practice ceased a few years ago. To recapture the spirit of this tradition, on December 9, 2010 a few church supporters recorded a kolyada entitled “Veed Zhodoo Sontsya”. CD copies were made and enclosed with the 2011 Kolyada greeting sent to parish members. 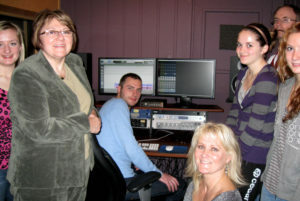 We gratefully thank Jonathan Wiebe for generously donating his time and studio to produce our recording. We hope that as you listen to this, you will be reminded of Christmases past – carolling, good food, family and friends. This carol tells the story of King Herod’s pursuit of the Virgin Mary and Baby Jesus. Upon hearing that Jesus was to be the “King of the Land”, Herod decreed the death of all male infants. As Mary fled from Bethlehem with her child, she came upon a farmer who was sowing his field. Mary wished him well and announced, “Tomorrow you shall reap.” By divine intervention, the next day the crop had ripened. As the farmer harvested his crop, King Herod stopped to enquire if he had seen a woman with an infant. The farmer answered, “Yes, but when I was still sowing.” Herod assumed that many months had passed and gave up his pursuit. Through some research, it was discovered that this carol is not well known outside of southeastern Manitoba. It may have been sung locally amongst the early settlers from Bukovina. A tax-deductible receipt will be issued. Thank you. We wish you and your family a joyful Christmas and health, happiness and prosperity in the New Year.